See what some of our customers have to say about their "Avalanche" systems. 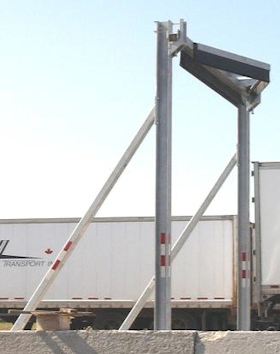 SLH Transport is committed to the continual improvement of our operations. It is this philosophy which led us to investigate ways of improving our winter operations. We wanted to find a way in which we could reduce turn around times, reduce operating costs and reduce the hazards associated with the clearing of snow from our trailers. After researching several different elaborate options, we approached a company to have them develop a simpler system that would be able to meet our needs, while keeping both operation and maintenance requirements to a minimum. What they designed was a far less complex and more cost effective system, that removed the snow from the tops of our trailers allowing it to be safely cleared away from the area by a truck mounted snowplow. Thus allowing for a much faster and safer method of snow removal. After several seasons of utilizing this product at multiple terminals, we have found it to be both effective and cost efficient. The dangers to our staff have been reduced. Turn around times have been improved. And as an added bonus, the safety of the general public has also been enhanced.